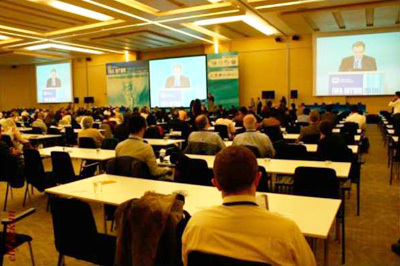 IWA Regional Conference and Exhibition on Membrane Technology and Water Reuse (IWA-MTWR-2010) was held in Istanbul, Turkey. This conference was the first conference organized jointly by Membrane Technology and Water Reuse groups of IWA. Latest developments related to membrane technologies in water reuse were discussed. There were totally 285 submitted papers for the conference and 134 papers for oral sessions and 121 papers for poster sessions were accepted. 15 of the orals were accepted as keynotes. Additionally, there were 4 plenary lectures in the opening ceremony. Plenary Lecturers were given by Hasan Z. Sarikaya and Lutfi Akca (Ministry of Environment and Forestry, Turkey - Wastewater Treatment and Reuse in Turkey: Present and Future Perspectives), Jorg Drewes (Colorado School of Mines, USA - Potable reuse: Overcoming the remaining constraints), Mathias Wessling (RWTH Aachen University, Germany - Real time fouling visualization) and Amy Childress (University of Nevada-Reno, USA - The paradigm shift from reverse osmosis: forward osmosis and pressure-retarded reverse osmosis). 218 visitors from 47 countries were registered to the conference. The distribution of registered participants were 72 (IWA member), 79 (NON-IWA member), 54 (Full time student) and 13 (Daily entrance). Additionally, 175 local visitors from Turkey visited the conference. As a total, 393 attendees registered to conference. There was also an exhibition in the conference and 25 exhibitors took place in exhibition area. 12 international companies, 7 national companies, 1 research center, 1 ministry, 1 university, 2 social clubs and 1 journal were attended to exhibition. A IWA Specialist Group on Membrane Technology: 17 technical visit session composed of three plants was obtained. The first part featured Pasakoy Advanced Biological Wastewater Treatment Plant, the second Kemerburgaz/ Odayeri Leachate Treatment Plant and the third part featured old water structures of Istanbul. There were three parallel technical sessions and 9 different topics were discussed in these sessions. These sessions were water reuse with membranes, membrane bioreactors, new membrane materials, membrane based seawater and brackish desalination, industrial wastewater treatment and reuse, membrane fouling and control for reuse, removal of emerging substances, energy production and hybrid membrane processes.